CAMP-of-the-WOODS offers a wide range of meeting rooms that can hold from 12 to 700 guests, perfect for main meetings or breakout rooms. 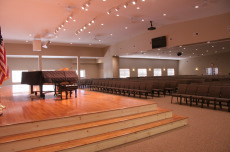 In addition, during the early fall and late spring we can host up to 1,365 guests in Tibbitts Auditorium centrally located in Camp. 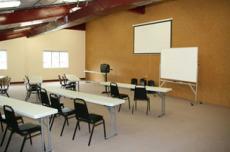 Click the title of the meeting room for layout and photos. 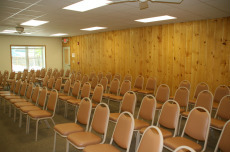 The Buirkle Conference Center is our largest year-round meeting space. Zeitfuss Lodge provides a main meeting room as well as a business office and a spacious lobby that can be used as a meeting room. Zeitfuss II provides a main meeting room as well as a business office and a spacious lobby that can be used as a meeting room. The Sonju Sports Complex offers a meeting room on the mezzanine level. 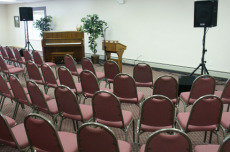 Tibbitts Auditorium is our largest meeting space. Only available for conferences in June and September.